Steve Bergeron: blacksmith and knifemaker. Steve is a combat veteran and Purple Heart recipient who has been working with metals, both professional and as a hobby, off and on over a period of twenty years. He became a certified welder at 18 after showing great interested in the machine and welding shops in his high school. Steve worked in plumbing and pipe-fitting industries for six years before joining the army. Upon his return home, he turned to traditional blacksmithing as a therapeutic outlet: handcrafting tools, hardware, gates, and artwork. The occasional knife or ax was thrown into the mix to keep things interesting. 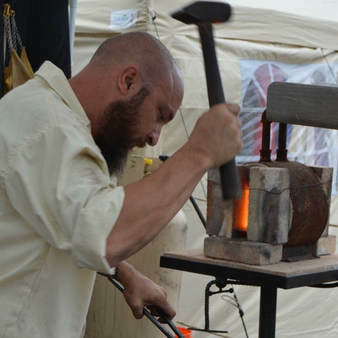 He began bladesmithing professionally, in addition to his artistic blacksmithing, 5 years ago. 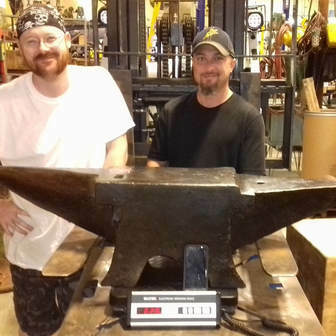 Steve is very hands-on with nearly every project Allenson Armory produces, and his passion for historical accuracy and his pursuit of perfection in his craft shines through with each piece that comes off his anvil.